Following the hailstone disaster last year that destroyed most of Bastide’s crop and severely damaged the buildings, the Durands were thrown into a financial maelstrom. We met up with Guilhem and Anne-Marie for dinner in April, we were delighted to hear that every cloud has a silver lining, and not just giant hailstones. The vineyard has a great reputation and they have decided to take early retirement. They have been very fortunate to find Chinese buyers for the château. Guilhem will continue to act as an advisor for the next 12 months, and his team is remaining intact. 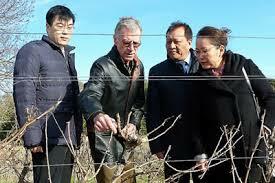 In the past 90% of their wines were exported, and it is likely that in the future a large part of this will go to China. We are shipping some of their reds later in the year, but this might turn out to be our last purchase after many years of success with their superb wines. In the meantime, they have bought a new house in Toulouse with seven bedrooms and a swimming pool and have moved in. We wish them a happy and well-deserved retirement.